This MURS 110 is ultra small in size, lightweight, and high power. 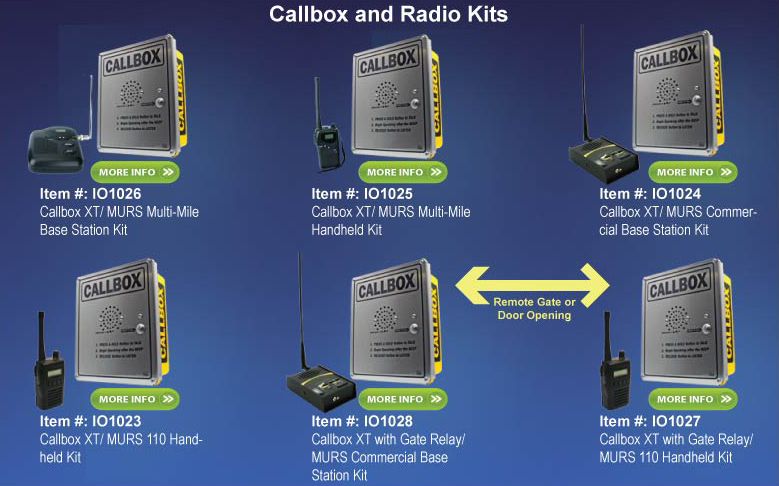 You can use it with our other MURS-labeled products, but this one is specifically good for use with our MURS Callbox with Gate Control. If you need to open a gate, all you have to do is press one of the feature buttons on the MURS 110 and it will activate the relay on the Callbox. See the applications and other products available for MURS in the MURS Brochure . (requires the free Adobe PDF Reader to view and print). If you just need a solution for your on-site and in-plant communications, the MURS 110 is an excellent solution to use with other MURS radios. At the push-of-a-button, you can be in two places at once to communicate with multiple work groups, coordinate activities, or expedite customer orders. If you are already using other VHF two-way radios, the MURS 110 can be field-programmed to match your existing radios. If you have UHF radios, a UHF version can be found by clicking the Two-Way Radios link under Product Categories on the left side of this page. The rugged and reliable MURS 110 portable radio will save you time and money by allowing your employees to work smarter and more efficiently with no air-time charges or monthly fees. It is built to Military-Specification standards , which makes it resistant to damage from drops, dust, and moisture. Three decades of designing, manufacturing, and supplying reliable, professional wireless communications products worldwide has led to one of the best two-way radios on the market today. This radio even has NOAA weather scan capability to make you aware of dangerous weather conditions. The MURS 110 also has an Emergency Call Feature which allows the radio user to immediately notify all other radios on the same channel. For example, if the radio user should become injured, trapped, or is in danger, a simple push of the orange button will activate this feature. When this button is pressed for 2 seconds the radio sends the alert tone which sounds in the speakers on other radios. The microphone on the sending radio is activated so the radio will transmit "hands-free" for 5 seconds after the emergency tone is sounded. This allows the person sending the alert to verbally call for help without having to press the button again. Use the MURS 110 for Security, Schools, Construction, Retail Stores, Manufacturing/Warehousing, Special Events, Maintenance, Hotel/Motel/Property Management, or any application where you need to be mobile, but still need to be in touch. Coverage estimates: At full power, line-of-sight, no obstructions the range is approximately 4+ miles. Indoor coverage is approximately 270,000 sq ft. Expect about 20 floors vertical coverage. Note: Range and coverage are estimates and are not guaranteed. Each radio includes: Flexible Antenna, Lithium-ion Battery, Spring Action Belt Clip and Dual Slot Charger (2.5 HR) with 110-240 VAC, 47-64 Hz cube power supply. There are also optional accessories such as speaker microphones and headsets that you can purchase. This unit comes preprogrammed with the five MURS channels all set with an Interference Eliminator code of 01 which matches our other MURS Radios. Unless you need other features activated, you should not have to program this unit, but it is field programmable. What is the range of these radios? : 2-Way Radio Range: How Far Can Two-Way Radios Communicate? Try the MURS Wireless for 45 days and if you are not absolutely delighted, send it back for a full refund of the purchase price. Ultra Small, Lightweight -Measures only 3 78 H x 2 78" W x 1 1/4" D and weighs 9.6 oz. Military Durability 810 F, IP 55 - Guards against rain, dust, shock, vibration. 26 Programmable Frequency and Privacy Codes and 158 privacy codes. 3 Programmable Function Buttons - Allows fast access to certain features. Key Pad Lock Button -Prevents accidental activation of front panel buttons. Large Speaker -Loud, easy-to-hear audio. 13 Hour Battery Life - Based on a 90-5-5 duty cycle. Channel Scan - Allows easy monitoring of multiple work groups. Internal Hands-Free, VOX-Ready - For tasks requiring hands-free communications...uses standard audio accessories. Call Tone Feature - Causes alert tone to sound in other radio's speaker...perfect for signaling others in noisy environments. Rugged Screw-on Accessory Connector - Customize with earbuds, headsets, speaker microphone. Emergency Call Feature - Sounds alert tone then hands free transmit for five seconds after button pushed. Each radio includes: Flexible Antenna, Lithium-ion Battery, Spring Action Belt Clip and Dual Slot Charger (2.5 HR) with 110-240 VAC, 47-64 Hz cube power supply. As advertised and potentially the lowest price on the net. Always fast shipping, a valued supplier. I recently purchased a handheld unit that receives signals from my gates intercom allowing me the freedom to work in the yard, check the back pasture fences or just work on my latest novel on the back patio without missing a delivery or visitor. The unit allows me to hear and open the gate and it's small enough to fit in my pocket. I would recommend it anyone. Very happy with the radio and the voice quality.Worked perfect in an 4 story apartment building. Great range, a true heavy duty handheld. A very decent base charger/holder. Well pleased. Worked instantly. Very robust radio that will take some abuse. Fairly easy to program. Download the user manual per the instructions included in the box. Be careful with the URL. What looks like a "19" is actually "l9" (L9 but lower case L). I prefer the PDF user manual because I can search the document for exactly what I need instead of flipping pages.